An estimated 2 billion people live in countries affected by fragility, conflict and violence. Extreme poverty is increasingly concentrated in these areas, and governments and international agencies seek avenues to enable socio-economic recovery and to support people as they try to rebuild their lives and livelihoods. 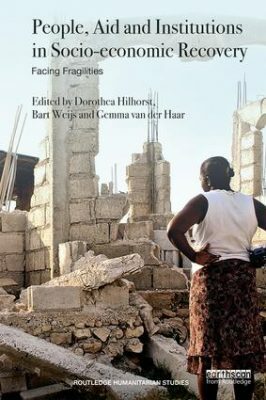 People, Aid and Institutions in Socio-economic Recovery: Facing Fragilities provides an in-depth understanding of people’s strategies in the face of conflict and disaster-related fragility and examines how policies and aid interventions enable their socio-economic recovery – or fail to do so. Through field-based research, the book captures the complex and unfolding realities on the ground, exploring the interfaces between economic, social and institutional change. This provides a rich and unique vantage point from which to reflect on the impact of recovery policies. The book provides a set of cross-cutting findings that aim to inform policy and practice. The detailed case studies of the book lay bare key dynamics of recovery. Set against the findings from two chapters that review the literature, the cases provide evidence-based lessons for socio-economic recovery. The chapters combine qualitative and quantitative methodologies and form a valuable resource to researchers and postgraduate students of disaster management, conflict, humanitarian aid and social reconstruction, and development management.